WILLIAMSPORT, Pa. -- Pearland's Little League All Stars started this game exactly where they wanted to be, in the winner's bracket. 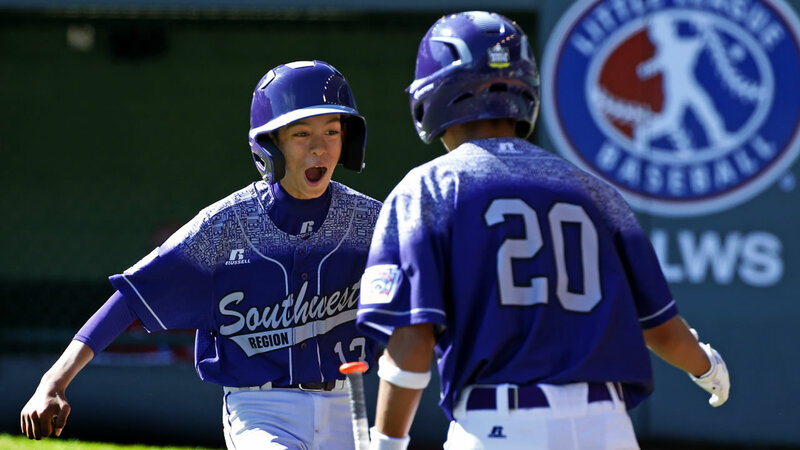 The Little League World Series tournament rewards the winners with days off between games. That gives starting pitchers time to rest and allows them to be available for the next game. Pearland's Isaac Garcia hit the first pitch of the game right to the Sweetwater Valley Short Stop but Levi Mendez could not handle it giving Garcia a single. Ben Gottfried then got hit by a pitch and with one out Zack Mack hit a single to the left field that scored Garcia. A miss handled ball sent Gottfried to third. After Marco Gutierrez got hit by a pitch Pearland had the bases loaded but Pearland could not get any of those runners across the plate settling for a 1-0 lead in the top of the first. In the bottom of the 1st Pearland pitcher Ben Gottfried used just 11 pitches to sit down the Bonita side keeping Sweetwater Valley LL off the bases and off the score board. Both teams managed to get base runners in the second but failed to score. Jarrett Tadlock took a 3-2 pitch to center to start the 3rd, then promptly stole second and reached third on a Bonita throwing error during the play. Zack Mack's sacrifice fly down the right field line then scored Tadlock, giving Pearland the 2-0 lead. Marco Gutierrez reached first on a pop up to right that landed just in front of the right fielder. Ariel Armas was bobbled allowing Solomon to reach first. That forced Bonita manager to change pitchers. But Conner DeLeon got a base hit to right. Errors on Bonirta allowed Solomon to score from first and sent DeLeon to 3rd giving Pearland the 5-0 lead. Isaac Garcia then sent a line drive to center that got under the Centerfielders glove and rolled to the deepest part of Lamade Stadium. DeLeon scored but Garcia was gunned down at the plate trying to stretch the hit into an inside the park home run. The hit gave Pearland a 6-0 lead. In the bottom of the third Gottfried sat down the first two Bonita batters before Antonio Andrade got to first on a strike out that was dropped by catcher Ryan Farmer. The next batter, Levi Mendez hit a double down the left field line to score Andrade and cut the lead to 6-1. Ben Gottfried then answered by striking out the next batter to end the threat and the inning with Pearland still in the lead. In the 4th Bonita's Levi Mendez settled down, striking out the first two Pearland batters and getting Zack Mack to hit a fly to right field. Pearland's Ben Gottfried entered the bottom of the 4th having thrown 43 pitches. Gottfried got the first Bonita batter to ground out, but the next batter, Jacob Baptista took a 3-1 pitch to the right field warning track, but it was no trouble for Carter Ostrom who got the out and a sigh of relief from Pearland fans. Four pitches later Gottfried recorded his 5th strike out of the game to keep the score 6-1. In the top of the 5th inning Bonita brought in its 3rd pitcher of the game, Nate Nankil who got all three Pearland batters to hit into ground outs and keep the score 6-1 Pearland. Bonita would challenge in the home half of the 5th inning. Pearland starting pitcher Ben Gottfried started with a strike out but trouble followed. The next batter hit a ground ball right to third baseman Jarrett Tadlock but Tadlock could not field it cleanly allowing Bonita's Nick Maldonado to reach first. Then pinch hitter Cameron Barbabosa hit a double to left field that put runners on 2nd and 3rd with one out. Antonio Andrade then hit a line drive to left that was easily snagged by Caleb Low who kept the runners in place for the second out of the inning. Pearland manager Andrew Solomon then called on Pitcher Isaac Garcia to close out the inning. Garcia did not disappoint, delivering a 4 pitch strike out of Bonita's Levi Mendez to preserve the 6-1 lead. Tristan Schwehr kept the pressure on Bonita by getting a base hit to start the final inning. A passed ball sent Schwehr to second. After a Conner DeLeon strike out Bontia's manager brought in Walker Lannom to pitch. After an Isaac Garcia strike out Ben Gottfried added to the lead he built by smacking a 2 run home to left center giving Pearland the lead 8-1. In the bottom of the 6th Bonita's Nate Nankil and Walker Lannom both got singles setting up a potential rally for Sweetwater Valley Little League. Isaac Garcia then got Bonita's Jacob Baptista to pop up to shallow left but Jarrett Tadlock made the catch for the first out of the inning. But Bonita was not through. Dante Schmid took a 0-2 pitch over the right center field fence. The 3 run home run brought Bonita to 8-4. Garcia then got Isaac Artalejo to hit the next pitch back to him and Garcia made the easy throw to 1st for the second out. Garcia then got into more trouble by hitting batter Nick Moldanado with a pitch. That brought up centerfielder Cameron Barbabosa who struck out on three straight to end the rally. The victory keeps Pearland in the winner's bracket. The next game will be Wednesday at 7 p.m. Central with a fully rested pitching staff. This is exactly where Pearland wants to be.